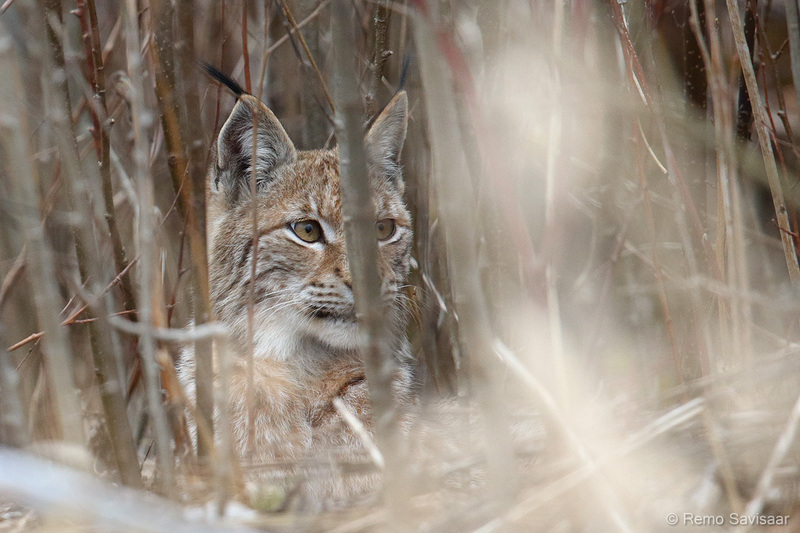 The expressive photo of a lynx photographed at close quarters in a springtime branch thicket is currently also part of the Animal of the Year photo exhibition ”Secret paths of forest cat” in the RMK Tallinn office. One spring day a friend living at the Peipsi shore called to tell me that he had met a lynx and also noted a prey animal killed by this lynx - a roe deer. I asked him about the landscape and conditions there and advised him how he might get good photos of the lynx. I had been in such a situation myself and I knew that a lynx usually returns to a freshly slain roe deer. The appetite of the lynx had been wetted and it does not abandon its prey easily. On stalking the animal one must stay at a distance, downwind and out of sight. The landscape there favoured such stalking. Looking at the map I made a prediction about where the lynx would hide and where it ideally might bring the roe deer – the present location was temporary. The lynx would surely drag the deer to a more sheltered place where it would be able to feed undisturbed. My friend however sent word that regrettably he would not be able to go and asked ”Can you come and take over?” The chance to see and maybe even photograph a lynx in the wild made me change my plans at once. I studied the whole background once again and set off. Reaching the spot I moved at about 40 kilometres per hour. And suddenly the lynx unexpectedly crossed the road about 25 metres further away. The same lynx! I only slowed down the car slightly and memorized the spot where the lynx passed. I saw where it took shelter. I drove on a couple of hundred meters, out of sight of the lynx and turned around there. I set up the camera, with the lens out of the window and started to approach even more discreetly. I only hoped that the lynx would still be there and that i would be lucky enough to discover it quickly in this thicket. That task was not an easy one. When I approached the spot i let the car roll in neutral gear, foot at the brake. I searched intensely and then noticed where the lynx was! I slowly stopped the car. It seemed that the lynx was certain that I did not see it. In fact, it did not even pay attention to me. I however was nervous – tried to find an öpen patch in the thicket where the lynx would be visible and there would be fewer branches hiding its face. The camera either focused on the branches or the image was not sharp. I knew that I had to act quickly and just took some photos, not at all sure if these were at all focused. I wanted to leave quickly because I was afraid that I might scare off the lynx by such near contact. At such close quarters I had not seen a lynx earlier. I wanted to pretend that I had not seen it. My stop lasted 10 seconds at most and after that i drove away. Only then I started to check the photos and found that some of the images had succeeded !